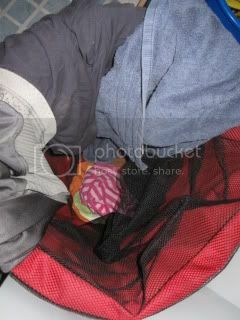 Why can't my husband manage to put the laundry IN the basket? I've seen him play sports. I know he has reasonably good aim. Better than this anyway. And what cracks me up is that it is empty except for one of Monkey 2's dresses (I had to shove it to the bottom so you could see how empty the basket really was. 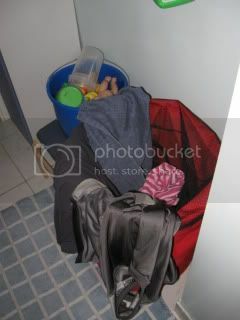 In the pictures above, the dress got caught on Husband's clothes, so it looks like it is at the top of a full basket). It doesn't actually crack me up. But if I don't laugh at it, I might cry. Or scream. Neither of which are productive (i've tried), so laugh I will. And I would NEVER think of complaining. Heavens, that would totally backfire and send us back to the days where clothes were left BESIDE the hamper. No no, complaining won't do at all. I just toss them in as I walk by. How do men just fall asleep? And they don't even have to be in PJs or in bed. This was taken a while ago, my baby is still a baby in this picture. But I've always been amazed at my husband's ability to fall asleep. Jealous probably better describes it. Especially when I'm on hour one of trying to fall asleep at night and he fell asleep before I could finish saying good night, lol. I don't think I have the ability to just fall asleep like that! that pic of him and monkey is adorable! And yes, you're lucky clothes end up in the hamper. My husband thinks that any basket or piece of furniture in my bedroom is a hanger. For our family of 5, we have 3 laundry large hampers to separate reds, lights, and darks. Plus we have a small one for white underwear and socks. 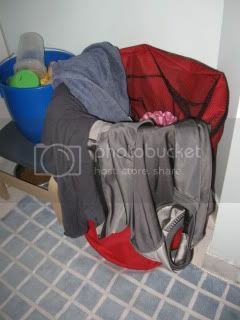 Do you think my husband can put his dirty clothes in the right hamper?